Modi must restrain butchers in BJP and bring ordinance to stop Cow slaughter & beef export. 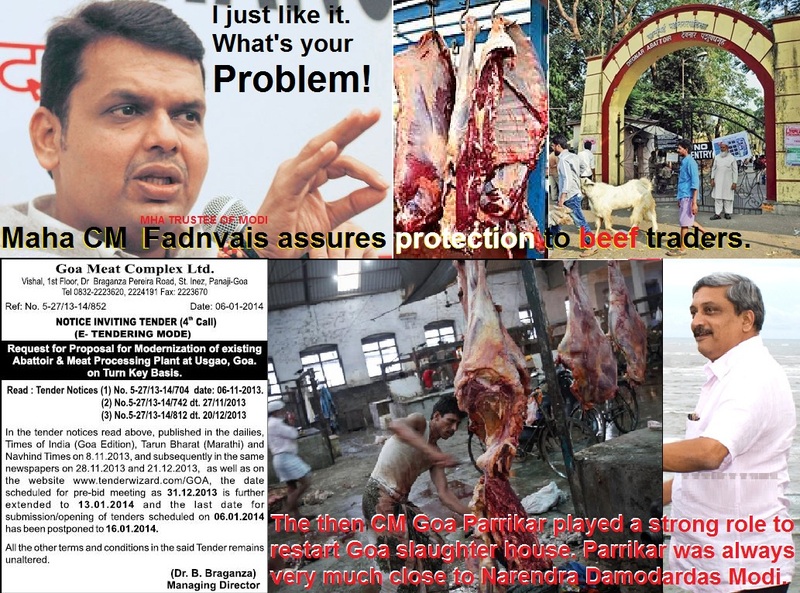 Maharashtra CM Fadnvais assures protection to beef traders, the then Goa CM Parrikar restarted cow slaughter house there………… They just like it. What’s your problem? PM Modi must restrain these BJP’s Cow abattoirs immediately and bring Ordinance to stop Cow slaughter and beef export. Remember what did you tell in Election campaigns. We think you are not a liar! Upananda Brahmachari | HENB | Mumbai | 12 Feb 2015:: It is shocking to know that Maharashtra (MHA) CM Fadnvais has assured protection to beef traders in Maharashtra who have been on strike for the past few days. The CM has said on Wednesday (11 Feb) that the rule of law will be followed and no one will be allowed to harass cattle traders and abattoir owners in the state. So far, beef traders and cattle traders had been complaining against harassment being meted out to them alleged by right-wing groups, while the various Go Raksha Dal (cow protection and animal lover groups) continuously urged the police and administration to check all illegal cow transport and beef trading violating existing laws of the state in force. It is said that for the tussle between ‘cow protectors’ and ‘beef eaters’, beef has not been available in nearly 75 major towns and villages of Maharashtra, with traders going on a strike. Beef is also not available in Deonar abattoir, which has the largest markets supplying nearly 100,000 kg of beef to Mumbai and adjacent every day. Most of the slaughter houses in Mumbai went dry due to non supply of cattle. At last, the great Hinduvadi, strong RSS man, Nagpur Orange, MHA CM Fadnvais took the side of the illegal cattle (mostly Indian breed cow) transporters and the illegal slaughter house owners only to appease the minority people, eyeing to Muslim Vote Bank Politics. Yes, it is done by a ‘Party with Difference’. My friends, Advocate Deodas Shinde from Sangli, Sri Chapalgaonkar (Ex Session Judge) from Aurangabad and Sri Nargolkar (Veteran Savarkar Expert) from Pune, all are saying that the BJP Govt in Maharashtra is very much reluctant to see any interest of Hindus and are in every mood to help the ‘beef eaters’ and to thrash the ‘cow savers’. Actually, it is not the only story of MHA, the same BJP run Govt of Goa is helping cow slaughter and sustaining the lifeline of illegal state run abattoir and taking stern steps against the cow savers of MHA and cow protectors of Goa. The allegations have also been surfaced that the Goa and MHA operators of BJP are taking huge money from the Muslims and Christians to continue slaughter of cows and buffaloes with out any hazards! This is very much embarrassing to see that the BJP Govt in Central and in the States in power are flouting the assurance of its Election manifesto of 2014. BJP is gradually deviating from its stand of so called cow protection. In its Election manifesto 2014 (part: LEAP FORWARD – IX, section: Cultural Heritage, point: Cow and its Progeny), BJP clearly stated that, “Necessary legal framework to protect Cow and its Progeny” and “National Cattle Development Board” and the party including its PM face Narendra Modi said several times, BJP would save the huge loss of Indian Breed Cow causing curse to the agriculture, health and overall prosperity in the country. So, BJP manifesto defined the “cow and its progeny” as integral to India’s cultural heritage — appealing to the party’s core constituency of Hindus who abhor eating beef. Not only that the big mouth Narendra Modi accused the Congress-led UPA government several times during election campaign for promoting “pink revolution” by subsidizing slaughterhouses that butcher cows and other animals, without seeing the provisions related to animal cruelty or the prohibition of slaughter rules already existing in different states. “Lal Bahadur Shastri used to talk of ‘green revolution’ but they are encouraging ‘pink revolution’ by promoting meat exports. They are giving subsidy to set up slaughterhouses… cows and other animals are getting slaughtered,” the BJP’s prime ministerial candidate told an election rally in Khandwa on Nov 23, 2013. But, what is doing these MHA and Goan PM by promoting both illegal cow slaughter and beef export? I have written several times (openly and through personal mails) to the Central and different State Govts, met Governors and statesmen to stop illegal cow slaughter and save the huge animal resource without yielding desirable change. 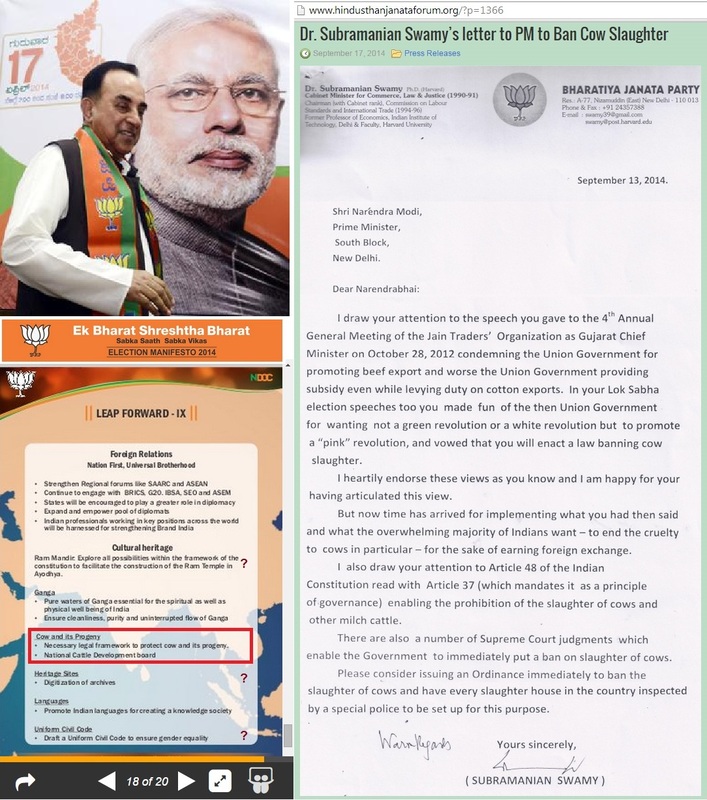 My appeals may taste the dust in the waste paper bin or take rest in the trash, but what’s the fate of appeal of Dr. Subramanian Swamy’s letter to PM to Ban Cow Slaughter. On 13th Sept, 2014, BJP stalwart and Hindu think tank Dr Swamy wrote PM Modi and his party colleague, “I draw your kind attention to the speech you gave to the 4th Annual General Meeting of the Jain Traders’ Organisation as Gujarat CM on Oct 28, 2012 condemning the Union Govt (then UPA II) or promoting beef export and worse the Union Government providing subsidy even while levying duty on cotton export. In your Lok Sabha speeches too you made fun on the then Union Government for wanting not a green revolution or a white revolution but to promote a “pink revolution, and vowed that you will enact a law banning cow slaughter”. There are also a number of supreme Court Judgements which enable the Govt to immediately put a ban on slaughter of cows . Please consider issuing an Ordinance immediately to ban the slaughter of cows and have every slaughter house in the country inspected by a special police to be set up for this purpose”. But, without considering the request of Dr. Subramanian Swamy alongside the million appeals from the various Go-raksha (save Cow) organisations, the BJP counterparts of Maharashtra or Goa are rampantly allowing Cow slaughter and beef export with the high blessings of a ‘Hindutva Poster Boy’ Narendra Modi, the PM of India. Mind the RSS silence about this matter. RSS approved the PM candidature of Modi on four agenda of it. 1. Construction of Ram Temple in Ayodhya. 2. Introduction of Uniform Civil Code. 3. Repealing Article 370 on Kashmir and 4. Protection of cows. All the four conditions are dumped by BJP and RSS is most probably very happy with the induction of Ram Madhav in BJP central committee to pace the complete secularization BJP as soon as possible through Gandy worship and development mantra. The double speak of BJP in the matter of Go-raksha (Cow protection) is really conspicuous and intolerable. On the one hand they are eye washing by setting up Rashtriya Gokul Mission under Department of Animal Husbandry, Dairying & Fisheries, which envisages funding “integrated cattle welfare centers” called “Gokul Grams” to protect local cows from being cross-bred into different varieties and save them form abattoirs (*ensures full life span as indicating, ‘After death the cow will be sold to produce various products’, no other sell provision for slaughtering at any point) and propagating the thoughts of “Gopal Ratna” and “Kamdhenu” awards; the same Govt is making strategy out of tabled mission as, “The scheme would also focus on upkeep of cattle after they are part of milk producing phase, when they can be utilized for meat”. (vide YOJANA, Sept, 2014). As now MHA CM Devendra Fadnvais ensures cattle trading, Cow slaughter and beef marketing as it done earlier by the then Goa CM, Monohar Parrikar, at this point we may expect another Champion Narendra Modi, the PM India to fire on all the judgments of Hon’ble Courts and regulations to feed beefs to his Muslim brothers and sisters who only live on that food! 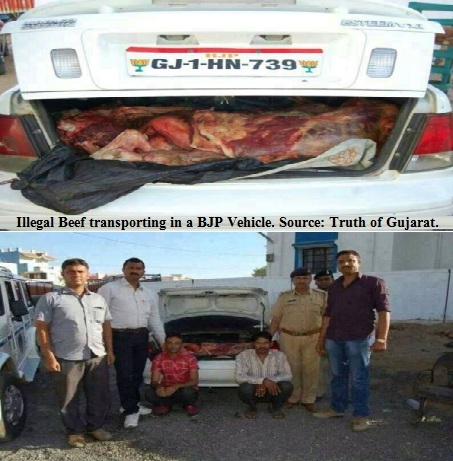 With much irritation and anguish I am to refer a news link here where it is evident that a BJP vehicle was engaged in illegal beef transportation in Gujarat. I tried to get further authentication of this report without result but saw no denial of that matter from the party as such. Corers of Hindus are supporting BJP as a Nationalist Hindu political party. They also want the development agenda of BJP, but not at the cost of evading all Hindu sentiments and Hindu interests. PM Modi must restrain MHA CM Devendra Fadnvais and the Goa Govt from their dangerous intention to kill Cows and beef exporting and also bring such Ordinance immediately to stop cow slaughter and beef exporting from this land of Gopal Hrishna Bhagawan and Lord Sri Ram. Courtesy: Links and pics used above. There should be complete ban on Desi cow slaughter. A good step by President of India for approving Ban in Maharashtra. There should be all around awareness programme to make people understand the significance of Indian desi cow. Indian desi cow (not jersey cow or any other breed) has the superior and spiritual (not religious) value including her product like Milk, Urine & Gobar. There is direct link between her and mother earth. The peace and prosperity can be achieved on the earth by serving the desi cows. All people are not even aware of the significance of her product milk, urine & gobar. Her urine can cure dreaded disease like cancer, AIDS, may type of other disease and her gobar can be use as an alternative source of energy through gobar plant for generating cooking gas, electricity and gas for running the vehicles. We must work hard and target to bring law on complete ban on desi cow slaughter in the country through awareness programme, legal and political course. In order to achieve peace & prosperity on the Earth, we must put pressure on Modi Government to bring a law for complete ban on slaughter of desi cow, including calf & bulls. This entry was posted on February 13, 2015 by hinduexistence in Breaking India, Conspiracy against Hindus, Conspiracy against India, Demand of Common Civil Code in India, Goraksha, Hindu Demand, Hindu Heritage, Hindu Politics, Save India, Save India from Secular Menace, Save Indian Heritage breed Cows, Stop Cow Slaughter in India and tagged "cow and its progeny", "pink revolution", BJP Election manifesto 2014, bring Ordinance to stop Cow slaughter and beef export, Dr. Subramanian Swamy’s letter to PM to Ban Cow Slaughter, Goa CM Parrikar restarted cow slaughter house there, LEAP FORWARD - IX, Maharashtra CM Fadnvais assures protection to beef traders, Modi must restrain these BJP Cow abattoirs, Narendra Modi, Rashtriya Gokul Mission, RSS approved the PM candidature of Modi, We think Modi is not a liar!.